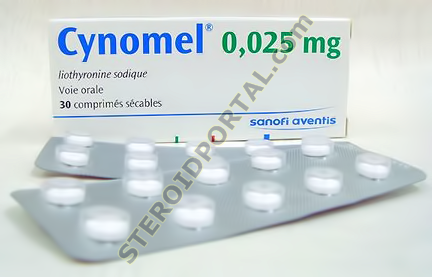 Cytomel is not a steroid, but more a of a cutting aid. It's a synthetic form of the thyroid hormone tri-iodio-thyronine or T3, made up of a metabolite of the amino acid tyrosine and 3 iodine ions. 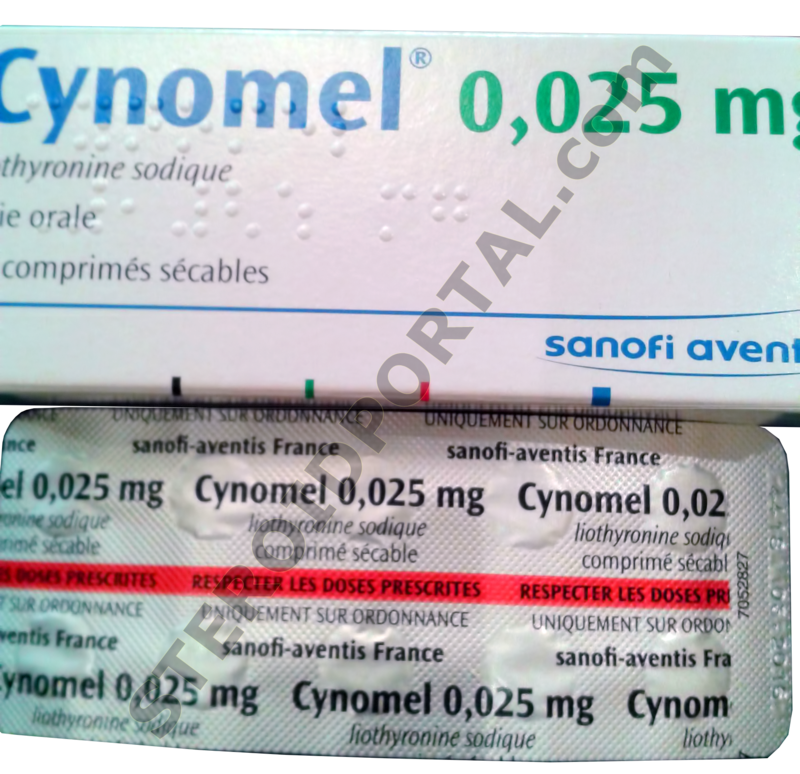 Cytomel is not a steroid, but more a of a cutting aid. It's a synthetic form of the thyroid hormone tri-iodio-thyronine or T3, made up of a metabolite of the amino acid tyrosine and 3 iodine ions. In the body it in turn is made from another hormone, T4, which is secreted by the thyroid under influence of the pituitary hormone TSH (Thyroid stimulating hormone). If a shortage of either TSH or T4 is noted, usually doctors may opt for a replacement therapy. 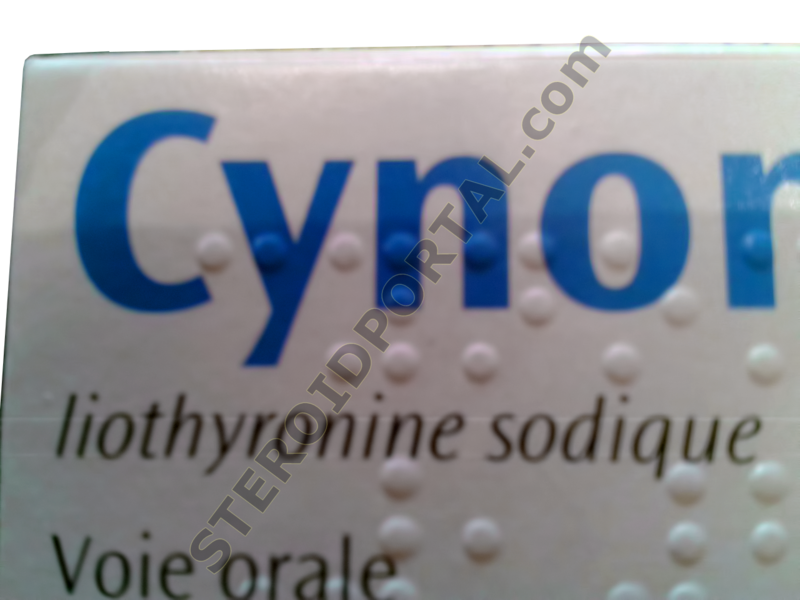 These days the most common prescription is synthetic T4 (synthroid), but in more severe cases of permanent thyroid dysfunction, the choice is given to Cytomel. Simply because T4 is mostly active through its conversion to T3 and T3 is 4-5 times stronger than T4 on a mcg for mcg basis. 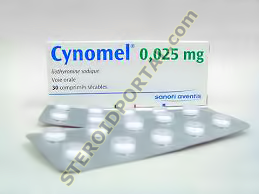 In bodybuilding circles Cytomel is mostly used as fat-loss drug. Thyroid hormones are often referred to as the metabolic regulators of the body. High levels of T3 speed up the metabolism of an individual, allowing him to burn more calories and use calories more sufficiently. Generally ectopmorphic body-types have very high thyroid levels and in some cases a slight undiagnosed form of hyperthyroidism. Both hyper-and hypothyroidism can have severe consequences on an individual, such as goiters and other nasty stuff, so messing with your thyroid is not something I would advise to beginners. As with insulin, misuse of this compound can leave you dependent on exogenous T3 for the rest of your life (remember Frank Zane?). So some caution and research is required before putting Cytomel in your body. Generally cycles should be limited to 4-6 weeks tops, I recommend 3 and alternating cycles with 3-week cycles of clenbuterol. But most importantly, to avoid a crash or a shock to the thyroid function doses need to be built up over time and tapered off again. More so for cytomel than for any other drug in existence. In his book, Anabolics 2002, Bill Llewellyn says that Cytomel is not a drug to start off on, and that use of milder drugs like T4 (Synthroid) or triacana can help ease a person into the use of T3. I'm inclined to disagree here however. Triacana is weak compound and I find of little use. Its not easily found anymore and not cheap either. T4 is basically similar to Cytomel except that its weaker. Something that users normally compensate with higher doses and sends them down a similar lane as simply using cytomel. Agreed, cytomel is NOT a drug for beginners, but with adequate research, experience with diet and some self-control, I don't see why cytomel shouldn't be the first thyoid compound used. But for recreational users looking for a fatburner, I still suggest using clenbuterol over cytomel for all intents and purposes. Cytomel is much more powerful, but clenbuterol is a lot safer for use. The results are easier to maintain with clenbuterol as well. Negative feedback in the thyroid may decrease natural levels of T3 in the body, causing a decrease of metabolic rate after coming off a cycle of T3. That can cause a rebound effect during which a lot of weight is gained back. It can be stacked or alternated with clenbuterol. We usually recommend to alternate, three weeks clen with three weeks cytomel, since clen loses most of its benefits after a short period of time and using cytomel for extended time-periods will increase the risk of permanent thyroid failure. Neither drug is terribly expensive so We see no problem in this. Some opt to use them together for 3-4 weeks, and then use an over the counter ECA stack to bridge with for an equal period of time, but we're not big fans of that. Which naturally doesn't mean its not effective, that's just a personal opinion. Running it for three weeks, one could choose for a schedule as follows: 25/25/25/50/50/50/75/75/75/100/100/100/75/75/75/50/50/50/25/25/25 mcg/day. If taken for 4 weeks, then run each dose for 4 days, 5 weeks then each dose for 5 days and so on. It is extremely important that the doses are tapered on and off and that a cycle never exceeds 6 weeks at the most. As far as adding products, no ancillaries are needed, but its highly recommended that this is only used when anabolic/androgenic steroids are also being used. First of all the extra free calories work with the steroids to enhance results, but also because an increased level of thyroid hormones can be extremely catabolic and the use of anabolic compounds to counter muscle loss is a requirement here. Increases metabolic rate of body tissues; is needed for normal growth and maturation. Protein binding is more than 99%. Biological t ½ is 2.5 days. Within 2 to 3 days. Replacement or supplemental therapy in hypothyroidism; TSH suppression for treatment or prevention of euthyroid goiters (eg, thyroid nodules, multinodular goiters, enlargement in chronic thyroiditis); diagnostic agent in suppression tests to differentiate suspected hyperthyroidism from euthyroidism; treatment of myxedema coma/precoma (IV). Acute MI and thyrotoxicosis uncomplicated by hypothyroidism; coexistence of hypothyroidism and hypoadrenalism (Addison disease), unless treatment of hypoadrenalism with adrenocortical steroids precedes initiation of thyroid therapy. PO 25 mcg/day initially, increase by up to 25 mcg every 1 to 2 wk if needed. PO 5 mcg/day initially, increase by 5 mcg/day at 2 wk intervals, if needed. PO 5 mcg/day initially; increase by 5 mcg/day every 3 to 4 days until desired response achieved. Infants a few mo of age may require only 20 mcg/day for maintenance; at 1 yr, 50 mcg/day may be required; and, above 3 yr, full adult dosage may be required. PO 5 mcg/day initially, increase by 5 to 10 mcg every 1 to 2 wk. When 25 mcg/day is reached, increase by 12.5 to 25 mcg every 1 to 2 wk if needed. PO 5 mcg/day initially, increase by 5 mcg/day at 2-wk intervals, if needed. IV 25 to 50 mcg initially. In patients with known or suspected CV disease, an initial dose of 10 to 20 mcg is suggested; however, base doses on continuous monitoring of the condition and response to therapy. PO 75 to 100 mcg/day for 7 days. Store tablets in tightly closed container at controlled room temperature (59° to 86°F); store injection in refrigerator (36° to 46°F). May reduce effects of beta blockers. May decrease thyroid hormone efficacy. May reduce effects of glycosides. Hypothyroidism; may cause decreased theophylline Cl; Cl may return to normal when euthyroid state is achieved. Consider changes in thyroxine-binding globulin concentration when interpreting thyroxine (T 4 ) and triiodothyronine (T 3 ) values; medicinal or dietary iodine interferes with all in vivo tests of radioiodine uptake, producing low uptakes that may not reflect true decrease in hormone synthesis. Palpitations; tachycardia; cardiac arrhythmias; angina pectoris; cardiac arrest. Hypersensitivity; weight loss; menstrual irregularities; sweating; heat intolerance; fever; decreased bone density (in women using drug long term). Not for use in obesity treatment. Ineffective for weight reduction indications and may produce life-threatening or serious consequences when used in large doses or in combination with other anorectics. Minimal amounts excreted in breast milk. When drug is administered for congenital hypothyroidism, routine determinations of serum T 4 or TSH are strongly advised in newborns. In infants, excessive doses of thyroid hormone preparations may produce craniosynostosis. Children may experience transient partial hair loss in first few months of thyroid therapy. Therapy should be started with 5 mcg every day and increased by 5 mcg increments at recommended intervals. Use caution when integrity of CV system, particularly coronary arteries, is suspect (eg, angina, elderly). Development of chest pain or worsening CV disease requires decrease in dosage. Therapy in patients with concomitant diabetes mellitus, diabetes insipidus, or adrenal insufficiency (Addison disease) exacerbates intensity of their symptoms. Therapy of myxedema coma requires simultaneous administration of glucocorticoids. Use corticosteroids to correct adrenal insufficiency in patients whose hypothyroidism is secondary to hypopituitarism. Liothyronine may rarely precipitate hyperthyroid state or may aggravate existing hyperthyroidism. Drug is unjustified for treatment of male or female infertility unless condition is accompanied by hypothyroidism. Patients are particularly sensitive to thyroid preparations. Sudden administration of large doses is not without CV risks. Small initial doses are indicated. Symptoms of hyperthyroidism: Headache, irritability, nervousness, sweating, tachycardia, increased bowel motility, menstrual irregularities, palpitations, vomiting, psychosis, seizure, fever, angina pectoris, CHF, shock, arrhythmias, thyroid storm. Instruct patient to take liothyronine as directed. Do not change or discontinue dosage without consulting health care provider. Explain that liothyronine does not cure hypothyroidism and that therapy will continue for rest of life. Instruct patient with diabetes mellitus to closely monitor urinary glucose levels. The daily dosage of antidiabetic medication may need readjustment as thyroid hormone replacement is achieved or if thyroid medication is stopped. Explain that partial hair loss may be experienced by children in first few months of therapy, but that this side effect is transient. Advise patient to wear medical identification (eg, card, bracelet). Inform patient that liothyronine's effects are more rapid than levothyroxine, which requires several days before onset of action. Teach patient to take pulse and inform the health care provider if signs of tachycardia or dysrhythmias occur. Instruct patient to call the health care provider immediately if any adverse symptoms such as chest pain, palpitations, headaches, irritability, increased nervousness, diaphoresis, tachycardia, dysrhythmias, or heat intolerance occur. Caution patient not to take liothyronine for weight control.